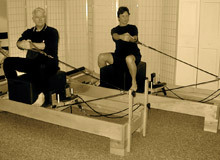 Pilates is an exercise technique which has been around for approximately 90 years. Joesph Pilates created his method of body conditioning by combining the best of Eastern and Western exercise approaches. The method focuses on breathing, strengthening, stretching, and proper alignment while exercising. The results are more energy, greater range of motion, and overall greater strength throughout your entire body. Classes can include floor exercises, known as Mat Class, and Apparatus exercises. There are four primary pieces of apparatus—the Reformer, Cadillac, Ladder Barrel, and Wundachair—along with myriad peripheral equipment Joseph Pilates invented for his clients’ use. Alternative Fitness offers Mat and Apparatus classes , as well as private and semi-private training. What makes Pilates different from other exercise programs? Pilates works to develop core strength by aligning and strengthening the body from the center out. Unlike traditional weight-training programs, Pilates works the body as a whole focusing the mind and body to work together. Every Pilates exercise is a full-body exercise. Pilates ultimately trains the body to work more efficiently, improving performance in other activities as well. Is Pilates a complete workout, or do I need to do something else to supplement my exercise routine? Pilates is a complete workout, strengthening the body and increasing range of motion. However, we do recommend adding a cardiovascular element to your repertory, such as walking on the treadmill or outdoors. Mat Classes teach all the basic principles of the Pilates Method and the exercises that are the basis for Joseph Pilates’ Method. The exercises are done on the floor on mats with specific coaching from the instructor. Class sizes are limited, so you can get individual attention and feedback on your form. Instructors use advanced variations and modifications that are appropriate for the level of the class. The focus of the class is strengthening the core, stretching, and bringing the mind and body into alignment, all with the use of proper breathing. Participants usually leave feeling energized, lighter, and taller. 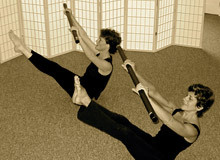 Apparatus classes consist of exercises done on the Pilates Apparatus….Reformer, Cadillac, Springboard, Wunda Chair and Barrels. These classes build on the exercises and principles learned in the Mat classes, adding an additional challenge to the work. As with the Mat classes, working on the Apparatus helps build a smarter, stronger and more balanced body. Intensity of exercises varies based on experience, and are done rhythmically with an emphasis on breathing and form. Everyone’s body is different, thus results depend on your body, and how often you do the Pilates work. Most people feel results in 10 sessions when attending classes at least once a week. Contact us by calling, or click here to e-mail us for more information. We divide our classes into two different sections: Mat and Apparatus. No matter your age or ability, we can help you improve your physical and mental health.